Big Excitement about Tiny Crafts. I never had a dollhouse. There was a communal one that we all played with, made of tin, at my grandmother’s house. And a grand Victorian that my grandfather made my sister when I was an age considered too old. It occurred to me when my boys were in preschool that they could have a doll house; they had a vague interest in the giant one at our little school. But the time came and went, and Legos entered our lives. Legos. We could fill a macro-sized dump truck with the Legos in our house. The most popular series under our roof is the line of Minifigures, from generic space guys to specialized licensed characters. We’ve got them in abundance. My almost-ten year old has versions of himself “in Lego.” Made his whole class “in Lego.” Made all the Greek gods and goddesses “in Lego.” We’ve customized some parts with Sharpie. And I have on two occasions made miniature rolls of toilet paper for a Lego port-o-potty. This has been the extent of micro-crafting at our house. McGuire, Margaret. Alicia Kachmar, Katie Hatz. Tiny Treasures to Make and Share. I found Microcrafts while browsing the 745s at my library’s main branch. There were thousands of books keeping this one company, but the enormous spool of thread on the cover captured me, and when I peeked inside and saw the miniature deer heads—into the book bag it went! 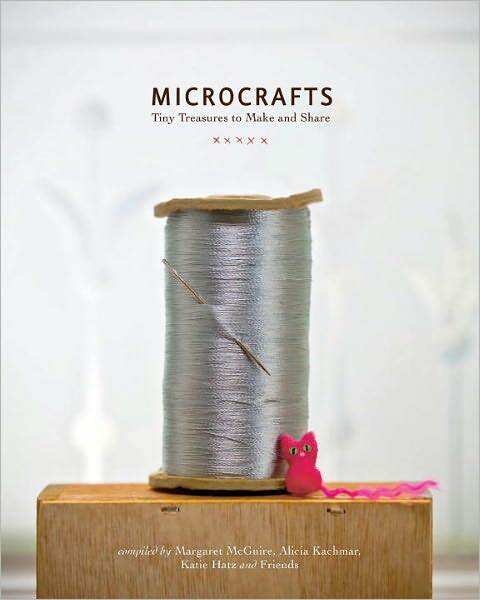 The microcrafts featured are very small scale versions of stuffed animals, sculptures, jewelry, books and cards. 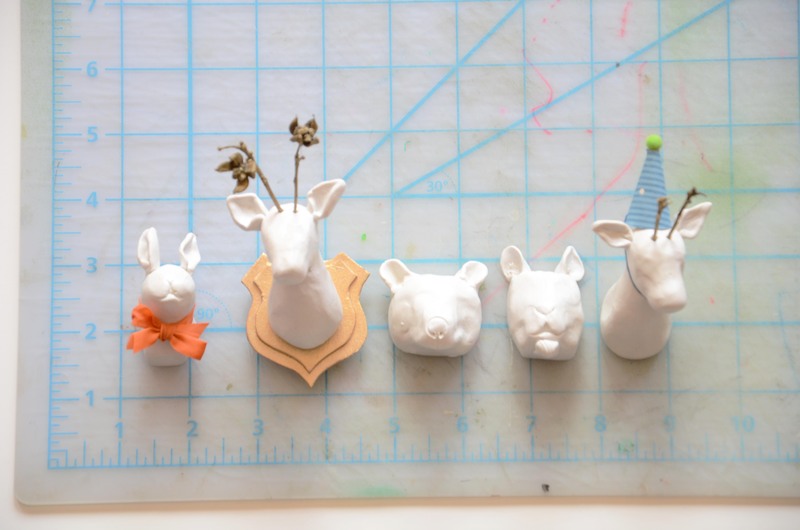 I generally steer toward purposeful crafts, and I have to say that outside of accessorizing a doll’s house, you may have trouble imagining what you’d do with some of these little trinkets. I suggest that most of the crafts can be glued to a magnet or clothespin, rendering them more useful. They can also punctuate a gift, be tucked into a lunch box, or be intentionally left on a park bench to be delightfully discovered. Absolute magic happened when I showed the book to my almost-8 year old son. He’s a tiger lover, a magpie, and a hoarder in training. And green is his signature color. I once rescued a green sequin from the gutter for this child. He saw the mini cat project, and had to have a tiger. Except in green. With gold stripes. He ran for his own supply of green felt, and green yarn. We sat and made this tiger-kitty in ten minutes, then painted his features. He requested orange felt be added to the shopping list. 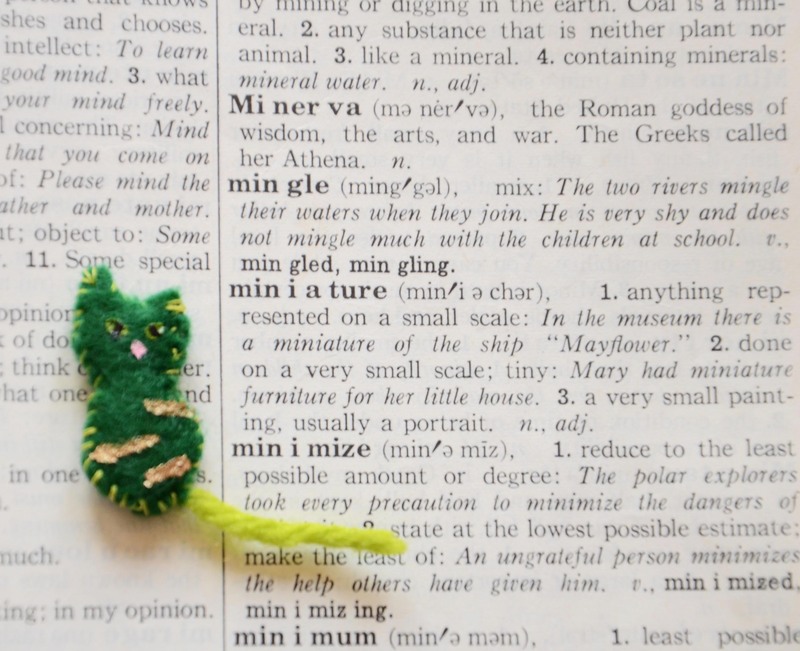 Invigorated with the quick success of micro-tiger, I set to work on the miniature book. I followed the instructions to the letter, since I knew the binding step would be easier if I didn’t make drastic alterations. And I must say, if this is your first foray into book-binding, just be patient. Follow the chart. Give yourself time to do the sewing in one sitting. You can hold the book with two fingers, and sew with the opposite hand, unlike a larger book that requires lots of cumbersome back and forth maneuvers. If you are completely new to book-binding, there are great books that take you step by step through many binding varieties. (If you fall in love with the craft, visit Dispatch from LA with Mary Ann Moss. She makes beautiful, authentically-Mary Ann books, and teaches online classes. Actually, you should just visit her site regardless. She makes good stuff). Midway through the process, I chose petite anchor-printed endpapers, and found a snippet of text about fair winds and sailing for the cover paper. At this point, I also had a recipient in mind, and I spent the rest of the evening building a book that will house a years’ worth of thank yous from a great class of fourth graders. 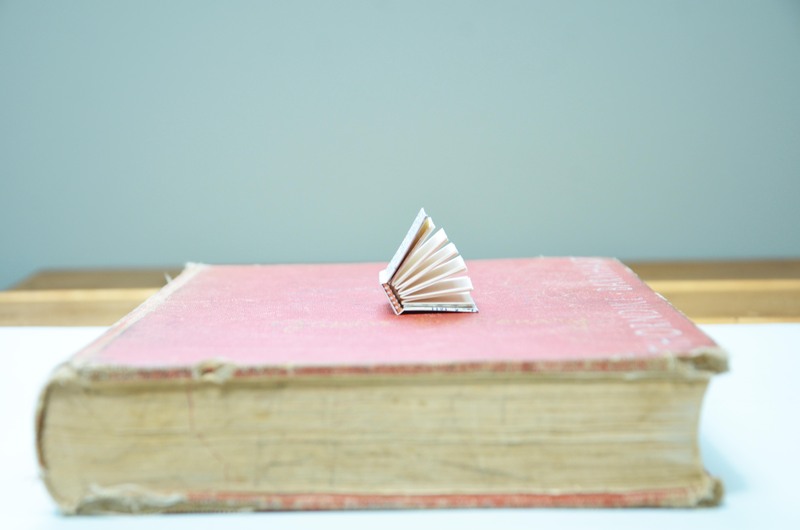 The miniature book instructions in Microcrafts yielded a fetching little book. I added endbands made from a piece of ribbon, and also affixed a jump ring so it can be worn as a necklace. I order my bookbinding supplies from Volcano Arts (Japanese screw punch bits, endband, needles) and Etsy for waxed linen thread. A quick search of “miniature” on Etsy or Pinterest produces thousands of small things, perfect for terrariums, doll houses, and curios. But I think some of them may also have potential for one of my favorite things—water globes. This book is for all levels of crafter, especially one who likes to sew tiny felt animals or assemble micro-scraps of fabric and paper. It is light on prose, but is brimming with great photography and descriptive instructions. Many projects feature a little magnified snippet with a tip on managing such a small pieces. There is a reference section in the back focused especially on the miniature scale. (Hint: toothpicks, nail art brushes, and HO-scale railroad people are recommended). Also, there is a section for modifying Microcrafts, plus a list of shopping resources. You can read more at: www.quirkbooks.com/microcrafts. Margaret posts on Pinterest. Alicia’s Etsy shop is: eternalsunshine.etsy.com. Katie’s Etsy shop is: katiehatz.etsy.com. The contributor’s section of the book hosts fourteen more artists, and their respective online spots. Thanks, Margaret McGuire, Alicia Kachmar, Katie Hatz, and Co., for compiling a book that surprised and delighted all members of my family, helped us use 3 dozen toothpicks, and compelled me to buy a rainbow of felt. *I welcome all advice on the pair of dwarf lemon cypresses that I happen to think were failing when I purchased them. They should be bright chartreuse. They are crispy and brown, and—I fear—done for.